Pregnancy has been a catalyst for many new things in my life, one of those being the discovery of nutritional powerhouses, like Mr. grass-fed gelatin. And it didn’t take me long to uncover all of it’s amazing healing qualities, for pregnant women and for non-pregnant people alike. 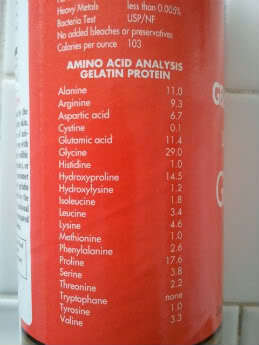 Gelatin is the collagen found in the skin, bones and connective tissue of animals (the powder form I use comes from cows). Think of roasting a chicken. You know all those glorious juices that fall to the bottom of the roasting tray? A lot of that is the collagen/gelatin. Stick it in the fridge and you’ll see it turn to jelly. Like everything we put into our bodies, it’s important to consider the source! We want the gelatin that we’re ingesting to be sourced from animals that have eaten naturally and lived good lives, like the humanely treated, grass-fed cows from Great Lakes. It’s just common sense really. If the cows are living stressful lives and eating rubbish food, we will take in that nutrition and energy as well. Skin health: Improves elasticity and smoothes those wrinkles. Gelatin is basically collagen and that’s what your skin needs more of to stay healthy. It’s also packed full of amino acids, the one in greatest amount being glycine. Just check out the profile from Great Lakes by clicking on the picture to the right. These amino acids are the building blocks of your body, including the health and wholeness of your skin. Joint health: Helps with arthritis because of it’s anti-inflammatory properties. And again, those amazing amino acids, help to strengthen and repair the body, specifically in this case, the bones and cartilage. Digestive health: When I was battling with my own digestive distress, I started to consume homemade chicken broth on a daily basis, which was full of gelatin, and I have no doubt it was fundamental in aiding my digestive tract to heal and come back into balance. It was so so soothing to the lining … I could literally feel it healing me. Aside from my personal experience, you will not be hard-pressed to find many well-known, highly respected doctors, authors, etc singing the praises of the wonderful benefits that bone broths have on digestive health. One of my favorites is Dr. Natasha Campbell, author of GAPS. Better sleep: Ingestion of glycine before bed has been shown to improve the quality of night time sleep. Roasting bone-in meat such as chicken, lamb, or one of my new personal favorites, oxtail. Bone broths. After roasting, you can chose to throw the bones and gelatin into your slow cooker with some water, and simmer on low for up to 12 hours. This will help to extract even more of the vitamins and minerals within the bones and give you a tasty way to ingest the gelatin. Powder form. Add a grass-fed powdered gelatin to an array of foods to get your daily dose. My favorite way of the moment is to make these super easy gummies, or by simply adding it to a warm water at night or a smoothie in the morning. But there are loads of other ways to eat it, just google ’til your heart’s content! ***If adding to a hot drink, you first need to dissolve it in a bit of cold water, and then once dissolved you can add the hot water. ***Also, 1 Tbsp of powder is good for about 1 pint of liquid. *** There is an opinion that it is best to ingest gelatin on an empty stomach, either 30 minutes before consumption of food or 2 hours after. Dr. David G Young, a naturopath from Oregon, believes that if it’s taken with food, it will only be used for energy/calories, but if it’s taken on an empty stomach it will actually be reversed back into collagen, giving us the benefits we are looking for. This is something worth considering. Good enough reason for me, too. Have already started my gelatin routine. Thanks for the valuable info, Lisa.